An Aztek Above The RestAll Azteks are amazing - hey now - NO HATERS! However... there are a few that stand above the rest. NASCAR, GM one offs, home-made super mods, etc. - we've collected them all here. Members' GalleriesThe Aztek Fan Club members are a busy bunch! 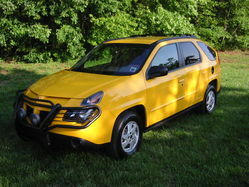 < Click the yellow Aztek to the left and check out the images they've posted up to share. You'll find factory Azteks, home-made add-ons, upgrades, artwork... AND MORE! 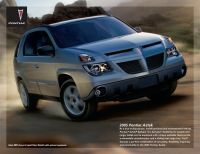 Pontiac Aztek Literature & BrochuresOfficial Pontiac fliers, sale sheets, manuals and the like.